In layman’s terms nanotechnology is the manipulation of man-made and natural material on a microscopic level. In the nano-scale, substance presents the different physical, chemical or biological properties from the normal scale.Nano technology is applied to manipulate, or control molecules and atoms to assemble the new structure for showing new mechanism and properties. What is more, on nano basis we can design and invent new materials and tools with whole new function. Nano technology has a wide coverage from basic science to applied science including Physics, Chemistry, Material, Photoelectricity, Biology, Medicine and so forth. Nanometer is a kind of measure, like centimeter or meter. It is the sort of discovery instead of invention. One nanometer=one of billionth meter, it is as a marble in comparison to the earthNano structure is around 1~100 nanometer，just between molecule and submicron meter. Sunlight can be roughly divided into visible lights and invisible lights. Through the prism, visible lights would be deflected into purple, blue, green, yellow, orange, and red lights. The invisible lights’wave length is between 0.76-1000 micrometers,it is called infrared Far infrared' wave length is between 4- 400 micrometers, ninety percent of it' wave length is between 8~14 micrometers. It has already been officially recognized as the light most effectively accelerating the growth of animals and photosynthesis of plants. Scientists call it the light of life. Besides radiating from the Sun, FIR can also be emitted from heated soil or stone mine. IR is a sort of electromagnetic waves, and FIR is the most human friendly electromagnetic wave. Any object whose temperature is at above absolute zero(minus 273 celsius) can radiate IR. The wave length of IR is between 0.75 and 1000 micrometers, by difference in capacity ， it can be classified into near IR, middle IR and far IR. 1.Radiation : Direct transmission to the object without help of air. 4.Heat effect : Convert extraneous electromagnetic waves into heat inside human body by molecular collision and radiation. FIR can make molecular cluster of water resonate to become independent water molecules, it can increase blood oxygen to reach the rejuvenation of cells. Water molecules can be converted into heat through the resonation, it would stimulate the energy deep inside, slightly raise up hypodermic temperature, accelerate blood circulation. converted into heat. To improve microcirculation system and expel the toxin out of body. FIR could purify blood, improve skin condition, prevent gout caused by too high uric acid. The term ‘nanotechnology’ encompasses a huge range of activities. ‘Nano’ is used in the world of science to mean one billionth. E.g. a nanometer is a billionth of a metre. A nanometer is only ten atoms across! 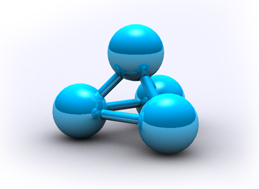 So generally nanotechnology is used to mean technology at the nanometer level. Nanotechnology attempts to achieve something useful through the manipulation of matter at this level.To put it more formally, the Royal Society use the following definition:“Nanotechnologies are the design, characterization, production and application of structures, devices and systems by controlling shape and size at nanometer scale.” At such scales, the ordinary rules of physics and chemistry no longer apply. For instance, materials’ characteristics, such as their colour, strength, conductivity and reactivity, can differ substantially between the nanoscale and the macro. Carbon ‘nanotubes’ are 100 times stronger than steel but six times lighter. Physicist Richard Feynman gave a ecture to the American Physical Society in 1959 which foresaw advantages from manufacturing on a very small scale – e.g. in integrated circuits for computers, for sequencing genes by reading DNA molecules and using machines to make other machines with increasing precision. However, the term ‘nanotechnology’ was first used by Norio Taniguchi in 1974, in a talk about how the accuracy of manufacturing had improved over time.He referred to ‘nanotechnology’ as that which achieved greater dimensionalaccuracy than 100nm. Feynman also envisaged machines that could pick up and place individual atoms. This development of this idea was laterassisted by the invention of the scanning probe electron microscope (SPM) which allowed scientists to ‘see’ and manipulate the individual atoms in a surface. In 1989 one of the defining moments in nanotechnology occurred when Don Eigler used a SPM to spell out the letters IBM in xenon atoms. For the first time scientists could put atoms exactly where they wanted them. Molecular building blocks - Another great eap forward occurred in the shape of a new form of carbon. Harry Kroto from the University of Sussex, together with Richard Smalley and Robert Curl, discovered the carbon 60 molecule, which is shaped like a soccer ball. They named the molecular structure after the similarly shaped geodesic dome structure pioneered by the architect Buckminster Fuller. 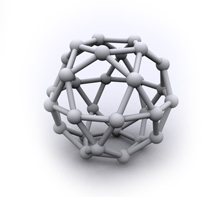 Unfortunately Buckminsterfullerene’ is too long a name for most people and so they are often called Buckyballs’! nanotechnology features the use of micro- and nanolithography and etching. Here, small features are made by starting with larger materials (e.g. semiconductors) and patterning and “carving down” to make nanoscale structures in precise patterns. Complex structures including microprocessors containing hundreds of millions of precisely positioned nanostructures can be fabricated. Of all forms of nanotechnology, this is the most well established. or molecular nanotechnology (MNT), applies to building organic and inorganic structures atom-by-atom, or molecule-by-molecule. Here we are using the forces of nature to assemble nanostructures – the term “self assembly” is often used. The self assembling properties of biological systems, such as DNA molecules, can be used to control the organization of species such as carbon nanotubes, which may ultimately lead to the ability to ‘grow’ parts of an integrated circuit, rather than having to rely upon expensive ‘top-down’ techniques. Nanotechnologies are widely seen as having huge potential in areas as diverse as healthcare, IT and energy storage. Governments and businesses across the world have started to invest substantially in their development. However there are also concerns regarding the safety of nanotechnology. These range from the more fanciful (such as Eric Drexler’s imagined scenario of a world reduced to “grey goo”, caused by self-replicating nano-robots) to the more realistic (such as the possible dangers of foreign nano - particle s entering human organs and the bloodstream). trying it in his Mitsubishi Pajero 2.5 diesel. The results were striking. “The first thing I noticed was the engine seemed to start more smoothly. To make sure I wasn’t imagining it, I took the device off again, and it there was definitely a loss of smoothness. 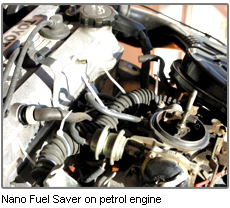 The Pajero is used for round-town motoring, and the fuel efficiency has improved by 10%. “To check it out further, I fitted the device to a 1972 Range Rover after towing a race car from Christchurch to Timaru. The trip back, with the same load, used 15 litres less fuel than on the way down.” Austin has also fitted a Nano Fuel Saver for the owner of a Holden Commodore V8. 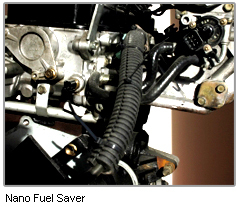 “He is over the moon with the improved fuel mileage.” For maximum efficiency the Nano Fuel Saver must be fitted on the fuel line (or lines) as close to the carburetor of fuel injectors as possible. The rubber tube can be easily cut to fit the fuel line next to the inlet manifold, and any surplus can be added to other parts of the line. 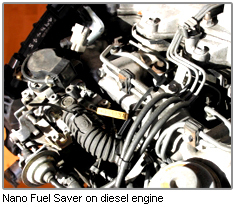 Simon Nutt, publisher of Canterbury’s Digest, is one motorist who can vouch for the Nano Fuel Saver’s effectiveness. “I had one of these devices fitted to our 2002 Land Rover Discovery 2.7litre diesel, a vehicle which has a range of 750km on the open road. We went to Arrowtown recently and got 900kms between fills.” Canterbury’s Digest has seen written testimonials from other local motorists, including the owner of an older, high mileage Toyota station wagon who reports a 12% increase in mileage around town, and an 18% improvement on the open road.